FM Approvals has recently learned that several models of Globe Fire Sprinkler Corporation (Globe) automatic fire sprinklers have been counterfeited and distributed in the Middle East market. The counterfeit sprinklers were all found in the country of Kuwait. *Authentic Globe GL5651 sprinklers use a 5mm thermal sensitive element, so an authentic Globe GL5601, which has similar attributes to this counterfeit GL5651, was used for comparison. **Globe does not manufacture a model GL5676, however, Globe does manufacture a model GL5670 with the same or similar attributes. ***Globe produces a model GL5681, but it is a dry barrel-type sprinkler. Instead, an authentic GL6564, which has similar attributes, was used for comparison. Figure 1 depicts representative samples of an authentic (right) and a counterfeit (left) model GL5651 sprinklers. 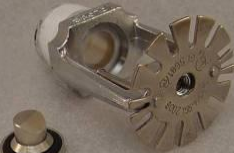 The chrome finish on the frames of the sprinklers can be used to identify a counterfeit sprinkler. In the examples shown, the surface finish on counterfeit sprinkler is smooth and highly reflective while the authentic sprinkler retains the rough cast chrome plated finish. There are also differences in font type and size of the “GLOBE” marking on the wrench boss, as indicated by the red arrows. The other visibly apparent difference is the profile on the load screw, indicated by the blue arrows. 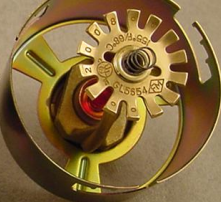 The load screw threads on the counterfeit sprinkler extend down to where it contacts the bulb, as opposed to the authentic sprinkler, where the threads terminate just below the load screw boss. The load screw diameter also tapers inwards down to where it contacts the bulb on the authentic sprinkler and does not on the counterfeit. Figure 2 shows the informational markings that appear on the authentic Globe GL 5651 deflector while the photograph on the bottom left shows the deflector markings of the counterfeit sprinkler. The most noticeable difference is the orientation of the stamping indicating the year of manufacture as pointed out by the red arrows. The bottoms of all the text and numeric stampings on authentic Globe sprinklers are oriented towards the outside edge of the deflector. 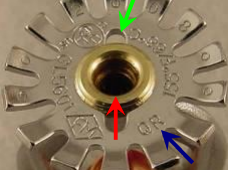 The blue arrows indicate differences in the compound used around the load screw; in the authentic Globe sprinkler, green thread lock compound is used around the threads while a clear sealant is applied around the top of load screw of the counterfeit sprinkler. The green arrows point out a subtle but noticeable difference in the length of the slots stamped out of the deflectors. Figure 3 shows enlarged views of the thermal activation elements found in the authentic (top) and counterfeit (bottom) sprinklers. Note the authentic Globe sprinklers utilize the Job model G5 bulb while the counterfeit sprinkler uses a Job model F5 bulb. Also more clearly visible in the photographs are the differences in load screw end profiles that were pointed out in Figure 1. Figure 4 shows the differences in the chrome finishes of the authentic Globe and counterfeit sprinklers of the GL5601 similar to those seen in the GL5651. The counterfeit sprinkler has a noticeably smoother, mirror like finish while the authentic does not. Unlike the counterfeit GL5651 sprinkler, the counterfeit GL5601 sprinkler has a very similar load screw profile to the authentic sprinkler however; there are differences again in the company name markings on the wrench bosses. 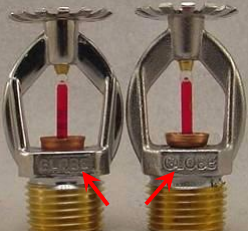 As apparent on the authentic GL5601 sprinkler, the “GLOBE” lettering is recessed while on the counterfeit sprinkler lettering is raised on a recessed background. It is important to note that the authentic sprinkler being used for comparison was produce in 2008, and as seen with the authentic GL5651 sprinkler manufactured in 2006, Globe has used raised lettering on a recessed background in the past and therefore, this is not a reliable way to determine whether a given sprinkler is counterfeit. 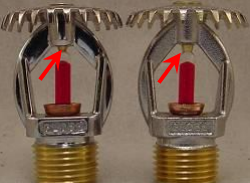 Figure 5 shows the informational markings that appear on the authentic Globe GL5601 sprinkler deflector while the photograph on the bottom left shows the deflector of the counterfeit sprinkler. 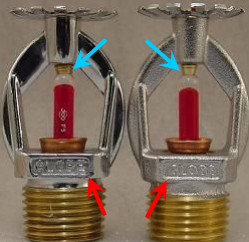 The most noticeable difference is the differing model designation and the lack of the “QR” stamping on the counterfeit deflector that is present on the authentic sprinkler deflector (shown by the blue arrow), indicating the sprinkler is rated for quick response. The authentic sprinkler used for comparison has the year of manufacture stamped on the deflector tines while the counterfeit sprinkler does not, although as seen on the authentic Globe GL5651sprinkler deflector, Globe has produced deflectors in the past with the year stamped adjacent to the other deflector stampings. It is useful to point out however, that the counterfeit sprinkler has the year stamp oriented upside down compared to an authentic stamping (see Figure 2). 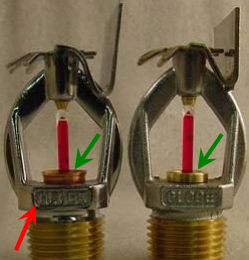 The red arrows indicate differences in the compound used around the load screw; in the authentic Globe sprinkler, green thread lock compound is used around the threads while a clear sealant is applied around the top of load screw of the counterfeit sprinkler. The green arrows point out the subtle but noticeable difference in the length of the slots stamped out of the deflectors. The photographs to the left in Figure 6 show enlarged views of the thermal activation elements found in the authentic sprinkler (top) and counterfeit (bottom) sprinklers. Note the authentic Globe sprinklers utilize the Job model F3SP bulb while the counterfeit sprinkler uses a Job model FR bulb. It is important to note Globe is Approved to use both the Job model F3 (with white bulb lettering) as well as the model F3SP (with gold lettering) in the GL5601 but is not Approved to use the Job model FR bulb. Any Globe GL5601 sprinkler with the FR marking on the bulb should not be considered an authentic Globe product. Figure 7 shows a counterfeit GL5676 sprinkler (far left) and an authentic Globe GL5670 sprinkler (immediate left). The counterfeit sprinkler frame finish, similar to the other counterfeit sprinklers, is mirror like and smooth whereas the casting roughness of the brass shows through the chrome finish on the authentic sprinkler. Also indicated by the red arrows are the differences in thread seal compound used on the load screw. The load screw in the counterfeit sprinkler was sealed with an opaque white compound, while the authentic sprinkler, consistent with the other authentic Globe sprinklers, had a green thread lock compound applied. As the blue arrows indicate, there is again difference seen in the font size and type used in the manufacturer mark on the wrench boss of the frame. 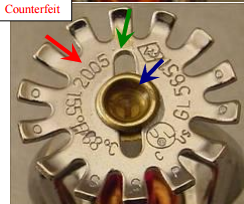 It should also be noted that while in the instance the counterfeit sprinkler uses a stamped/extruded bulb seat and the authentic uses a machined bulb seat, this is not a reliable way to identify a counterfeit sprinkler as Globe does also utilize a stamped/extruded bulb seat (shown by the green arrows). In Figure 8, the deflectors of the counterfeit GL5676 (far left) and the authentic GL5670 (immediate left) are fairly similar in all but one place. The authentic GL5670 has three slots in the edge of the deflector towards the frame, shown by the three red arrows, while the counterfeit deflector has one wide slot spanning most of its width. The top and bottom of that same edge of the deflector is different on the authentic version as well. In Figure 9, clearly visible in this photograph to the left are the two different thermal sensitive elements. 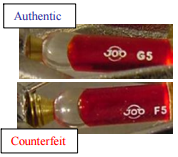 A Job F5 again appears in the counterfeit example while the authentic sprinkler uses a Job G5. The photograph to the left in Figure 10 shows both a counterfeit GL5626 sprinkler (far left) and an authentic GL5626 sprinkler (immediate left). This model is similar to the model GL5670 except it utilizes the smaller 3 mm thermal sensitive element. The counterfeit GL5626 sprinkler’s chrome plated surface exhibits a smooth and a highly reflective condition while the authentic GL5626 sprinkler’s chrome plated surface exhibits a casting roughness condition. Also, the size and type of font used in the manufacturer’s name on the wrench boss varies between the authentic and the counterfeit sprinklers, shown by the red arrows. 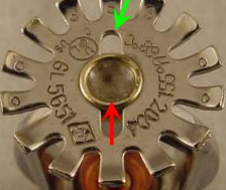 As was seen above the GL5676 counterfeit sprinkler and the authentic GL5670 sprinkler, the authentic GL5626 sprinkler employs a machined lower bulb support (as shown by the green arrow) while the counterfeit GL5676 sprinkler employs a stamped/extruded support. In this instance, this is again an unreliable attribute to use in determining the authenticity of a particular sprinkler. 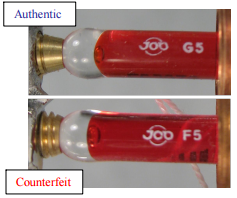 In Figure 11, the photograph on the left has red arrows indicating the difference in thread sealing compound and the application thereof between the counterfeit and authentic sprinklers. As seen in Figures 7, 5 and 2, the counterfeit sprinkler has thread compound applied such that it covers and partially or completely obscures the head of the load screw from view. In the authentic sprinklers, a smaller amount of green colored thread lock compound is applied. In Figure 12, the deflectors of the counterfeit and authentic GL5626 sprinklers are similar to their respective counterparts seen in Figure 8. The most noticeable difference is the contour of the edge of the deflector, and more specifically the three notches highlighted on the left by the red arrows on the authentic deflector and not present on the counterfeit deflector. In Figure 13, the photographs to the left show enlarged views of the thermal activation elements found in the authentic (top) and counterfeit (bottom) sprinklers. Note the authentic Globe sprinklers utilize the Job model F3SP bulb while the counterfeit sprinkler uses a Job model FR bulb. It is important to note Globe is Approved to use both the Job model F3 (with white bulb lettering) as well as the model F3SP (with gold lettering) in the GL5601 but is not Approved to use the Job model FR bulb. Any Globe GL5601 sprinkler with the FR marking on the bulb should not be considered an authentic Globe product. 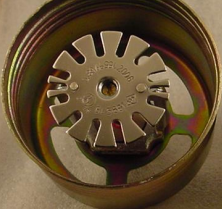 In Figure 14, as with the other counterfeit sprinklers, the counterfeit upright sprinkler had differences in the chrome plating on the frame consistent with the other cases (i.e. smooth and highly reflective versus the rough cast appearance of the authentic). 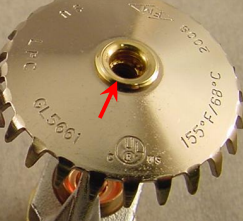 The counterfeit GL5661 sprinkler also employed a different load screw than the authentic (smaller) denoted by the red arrows in the photograph to the left. In Figure 15, on the left are enlarged photographs of the authentic and counterfeit GL5661 sprinkler deflectors. 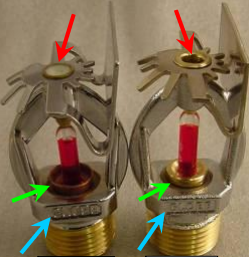 Consistent with the other counterfeit sprinklers, the load screw thread compound is different and applied differently, on the counterfeit sprinkler, as shown by the red arrows. 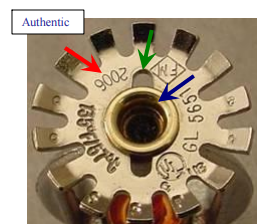 There are also obvious differences in the stampings, however, because the authentic sprinkler used for comparison does not share the same year of manufacture indicated on the authentic, and because the arrangement of stamped information may change periodically, this is not a reliable indicator of a counterfeit sprinkler. Figure 16 shows enlarged views of the thermal activation elements found in the authentic (top) and counterfeit (bottom) sprinklers. Note the authentic Globe sprinklers utilize the Job model G5 bulb while the counterfeit sprinkler uses a Job model F5 bulb. Also more clearly visible in the photographs are the differences in load screw end profile that were pointed out in Figure 14. Figure 17 shows the authentic GL5654 sprinkler and the counterfeit sprinkler with similar attributes, identified as the model GL5681 sprinkler. 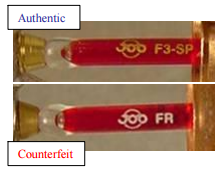 The counterfeit sprinkler shares no similar parts with the authentic version. Globe Fire Sprinkler Corporation does not manufacture concealed sprinklers with chrome plated frames and deflectors. Chrome plating is intended for aesthetic purposes and is therefore not necessary on concealed models where the frame and deflector are hidden from view by the cover plate and would only add cost to the final product. 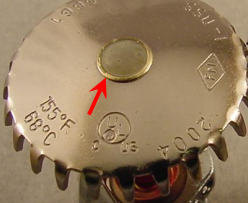 Figure 18 shows the counterfeit sprinkler version with the escutcheon and heat sensitive element removed, and the orifice seal and cap assembly placed alongside the frame assembly. The seal cap assembly was removed to determine the type of water seal employed in the counterfeit sprinkler. As shown in the photograph, the seal is an oring type, unlike the coated spring disc type seals used in all authentic Globe sprinklers. Also visible is one of the deflector pins, used for the drop down deflector, which is meant to slide downward after activation of the cover plate. Globe does not use a drop down deflector design in any of their authentic concealed pendent type sprinklers.